Corrugated cardboard has a high emissivity (ε = 0.95 approx.) which makes it very easy to measure the web temperature with our general purpose 8-14 µm sensors at various stages in manufacturing including preheating and gluing to ensure a strong glue bond and prevent warping. Sensors can be used with good results straight out of the box, with no need to change any settings. 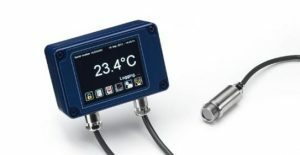 For new installations of temperature sensors, or for connection to existing instrumentation, we suggest our low-cost PyroCouple sensor, which has a choice of 4‐20 mA or thermocouple output options. In most locations, the web is wide and it is possible to measure a large area, so the wide-angle 2:1 optics are most commonly chosen. If there are obstructions or if the visible area of the web is narrow, 15:1 optics are commonly used. As there is often dust and glue present and high humidity, causing dirt or water on the lens which affects the accuracy of measurement, we suggest the use of an air purge collar. 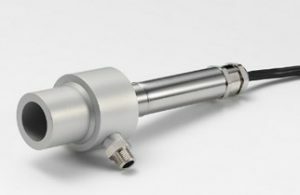 In some locations, such as the single facer, the sensor may be subjected to high ambient temperatures. A cooled version of the PyroCouple can be used here. Air cooling is usually sufficient to keep the internal temperature of the sensor below its limit of 70°C, so you can use the same air supply as for the air purge collar. Alternatively, we have a choice of sensors that withstand higher ambient temperatures with no need for cooling. The PyroMini sensor may be preferable as it has an optional sensing head which operates at ambient temperatures up to 180°C without cooling. This is a two-piece sensor with a miniature sensing head and separate electronics module. The PyroMini has an optional touch screen interface with built-in alarms and data logging. 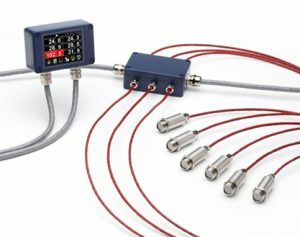 For measuring the temperature in multiple locations along the corrugator, the PyroMiniBus digital sensor with RS485 Modbus communications is ideal. This sensor operates at ambient temperatures up to 120°C without cooling. As the corrugator line is often as long as 150 metres, a network of PyroMiniBus sensors can be used to minimise the cost and complexity of cabling. Optionally, up to 6 PyroMiniBus sensors can be connected via the PMBHUB junction box to a local display (PM180) with data logging and RS485 Modbus master/slave interfaces. Each sub‐network of PyroMiniBus sensors can monitor temperatures on a section of the corrugator, such as a single facer, with a PM180 providing local temperature display, alarm visualisation, and (optionally) logging to MicroSD Card for quality assurance. A large number of sensors and PM180 displays can all be connected to a SCADA system either directly or via a panel PC using RS485 Modbus. We can supply industrial panel PCs, pre-loaded with Windows 7 and the CalexSoft 2 multi-channel temperature measurement software, which allow data to be measured and logged in real-time. 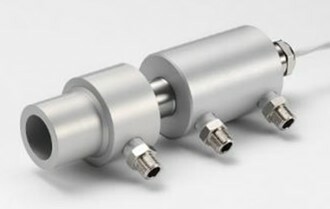 PyroCouple, PyroMini and PyroMiniBus sensors are typically attached to a metal bar mounted above or below the corrugated board web using the optional adjustable or fixed mounting brackets. When measuring corrugated board, there is no need to mount the sensor exactly perpendicular to the web. Due to the matte surface of most corrugated board materials, the measurement is just as accurate even at low angles. When measuring low angles, the measured spot becomes a longer ellipse shape. Please do not hesitate to contact Calex if you have any further questions about using our infrared temperature sensors to measure from corrugated cardboard, and we will do our best to help you.